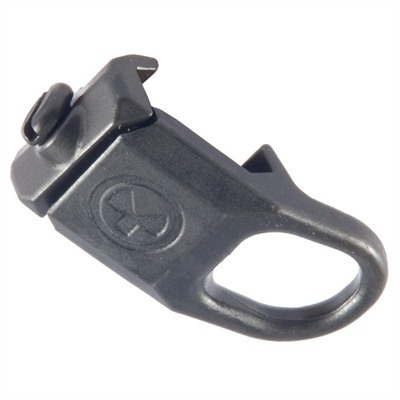 Low-profile sling loop clamps to any MIL-STD 1913 Picatinny or STANAG 4694 handguard rail to provide a secure forward attachment point for the Magpul MS2 or similar clip-on sling. Can be installed on left or right side of top rail, or side or bottom rails for multiple alternate sling configurations. Loop is angled to resist snagging on other gear. Rugged, all-steel construction withstands up to 300 pounds of stress pressure, so it won’t fail under hard use. SPECS: Steel, MIL-DTL-16232 manganese phosphate coated, black. 2" (5cm) long x 1" (2.5cm) wide. Projects 3⁄16" (4.8mm) from rail. 1.3 oz. (87g) weight.